Published on February 15, 2017. Marketing leadership turnover continued to soar last year. If you are chief marketing officer and you've held the job for more than four years, you are above average. CMOs have the shortest average tenure in the C-suite at just 4.1 years, according to a new report by organizational advisory firm Korn Ferry. That is about half the average tenure of CEOs, which is eight years. The short lifespan of CMOs is not all bad news. While the position is plagued by high turnover, it's also true that CMOs are in a good spot to be plucked for promotions. "Today's customer-centric CMO role is exceptionally complex and requires the right balance of left as well as right brain skills, and very importantly, a differentiated set of leadership competencies," said Caren Fleit, senior client partner and leader of Korn Ferry's marketing center of expertise. "CMOs with this unique profile are in high demand and are often recruited to lead the next transformation. Also, in some cases, short tenure can be attributed to the organization not being well aligned behind the change that the CMO is tasked with leading." 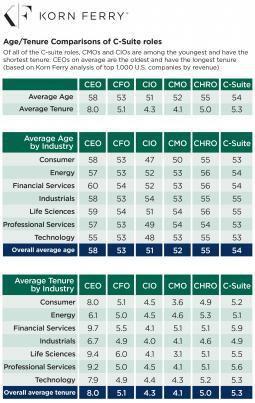 CMOs are also among the youngest executives in the C-suite, with an average age of 52. Only chief information officers are younger, and by just one year, with an average age of 51, according to the report. Marketing leadership turnover continued to soar last year. Recruiting firm Russell Reynolds tracked 177 marketing leadership appointments in the last two quarters of the year, up from 173 in the first half of the year. Total turnover for 2016 was the highest since Russell Reynolds began tracking it four years ago, according to a recent report. Of the CMOs who moved on in the first half of the year, 9% were internally promoted and more than 60% left their company for a new opportunity. Coca-Cola Co. is searching for an executive to lead agency relations after the departure of Sarah Armstrong, who since 2006 was the marketer's director for worldwide agency operations. A company spokesman confirmed that she left the company on Feb. 3 and a successor has not yet been named. She left for personal reasons, according to the spokeswoman. Ms. Armstrong was an Ad Age Woman to Watch in 2009. She was known for implementing a "value-based" compensation model in which agencies are paid a guaranteed fee based on the value of each project, with the potential to earn a performance-based bonus. "We want our agencies to earn their profitability, but it's not guaranteed," she said at an industry conference in 2009. "We need them to be profitable and healthy, but they have to earn it through performance." 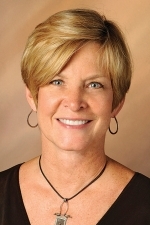 Ms. Armstrong's exit follows the departure of another influential agency relations executive. 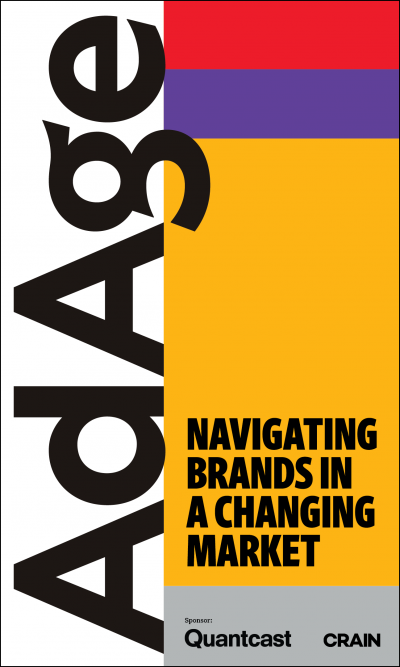 Debra Giampoli, the director of global strategic agency relations for Mondelez International, left the food marketer in December, a spokeswoman recently confirmed. But Mondelez does not plan to replace her. Instead, the company reshuffled its agency relationship responsibilities across the global and regional marketing teams, with global and regional marketing capabilities people handling agency relationships, supporting the brand teams, according to the spokeswoman. When is craft beer not craft beer? Apparently when it's a Walmart private label, according to a lawsuit filed Feb. 10 in Hamilton County Common Pleas Court in Cincinnati. Plaintiff Matthew Adam takes issue with Walmart 's private-label craft beers, launched last year under the Trouble Brewing brand, including Cats Away IPA. The complaint cites a Brewers Association definition of craft brewers as "small, independent and traditional," brewing fewer than 6 million barrels annually, and owned no more than 25% by a bigger brewer. Walmart's craft beers are brewed by a unit of Genesee Brewing, Rochester, N.Y., maker of Genny Light, which produces well over that limit, according to the lawsuit. Mr. Adams contends the craft designation made him overpay for beer priced at $14 for a 12 pack at Walmart. His class-action suit seeks an injunction preventing Walmart from further merchandising the brews as craft, plus unspecified money damages for himself and others. "We hold our suppliers to high standards and are committed to providing our customers the quality products they expect," said a Walmart spokesman in an email statement. "While we have not yet been served with the complaint, we take this matter seriously and intend to defend ourselves against the allegations." Mr. Clean can dance in the Super Bowl, but apparently not with the Pine-Sol lady on Valentine's Day. 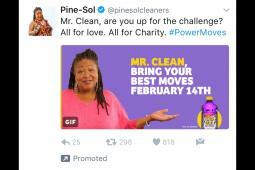 Pine-Sol, a Clorox Co. brand, issued a Twitter challenge during the Super Bowl for a Valentine's Day dance-off pitting longtime pitchwoman Denise Amos against the animated mascot of Mr. Clean, a Procter & Gamble' brand. Mr. Clean didn't show up. "The interesting part about Super Bowl advertising, is that when brands announce their plans ahead of time, it gives the competition some time to strategize," said Sacha Connor, director of marketing for Pine-Sol. 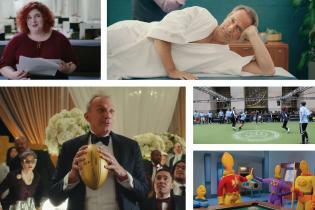 "So when we saw that Mr. Clean had a Super Bowl spot and it involved Mr. Clean dancing, we thought we could insert Pine-Sol into that conversation." Pine-Sol got more than 226,000 respondents to a Twitter poll in which 86% said Mr. Clean should dance with Ms. Amos. Despite snubbing the invitation, Mr. Clean did OK in social media himself. The brand came in No. 2 (to Bud Light) among Super Bowl advertisers in overall social engagements (such as likes and comments), No. 5 in positive engagements, and No. 1 in terms of both comments and amplification (shares and retweets) through Super Bowl Sunday, according to Origami Logic. Surprisingly given what it deals with, kitty litter has become hotbed of innovation and marketing in recent years. 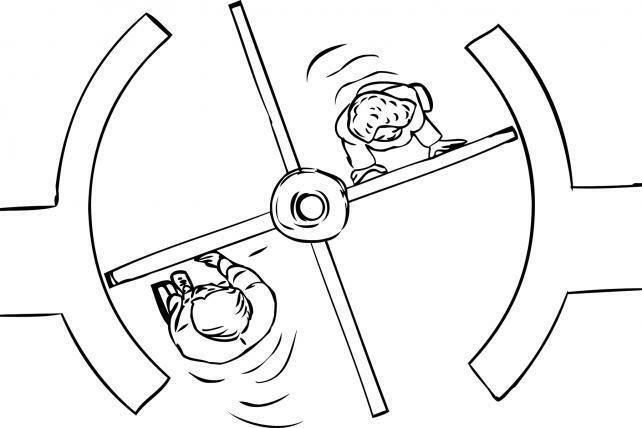 Consider Clorox Co.'s Fresh Step Odor Shield ClumpLock products with Febreze, or Katherine Heigl as a kitty psychologist pitching Oil-Dri Corp.'s Cat's Pride in TV ads last year. Now Church & Dwight Co. aims to do everyone one better with Arm & Hammer Slide, which, according to new ads from Ferrara & Co., Princeton, N.J., just slides right out of the box for easy cleaning -- just like grease through a goose. More on Clorox: Heidi Dorosin, a marketing executive behind Clorox's "Bleachable Moments" advertising, has a new job dealing with bleachable moments of a completely different kind. As new chief marketing officer of Madison Reed, she's working with an up-and-coming direct marketer of at-home hair colorants free of many irritating and controversial chemicals often found in similar products, including ammonia, parabens, resorcinol and phthalates. While the business is mainly online, Madison Reed in December opened its first retail location, a Color Bar in Manhattan. At Clorox Co., where she spent 18 years, Ms. Dorosin, was most recently general manager and VP-marketing of the $1.5 billion namesake business. Havas New York has had a busy start to the year, winning Mattress Firm's online-only Dream Bed brand and bringing on TBWA veteran Dan Goldstein as chief strategy officer. For Dream Bed, Havas is handling media, creative, data and technology, with the first work expected to be in market by early summer. 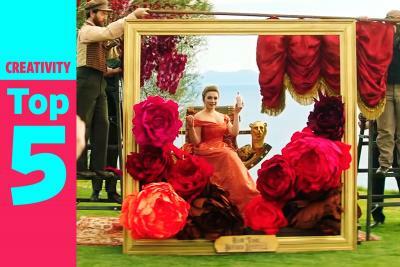 The brand previously handled its marketing efforts in-house. Mr. Goldstein, who started at the shop earlier this month after spending the last four years working in the startup space, is reporting to Havas New York CEO Laura Maness. Salty snack maker Wise Foods has picked Kastner & Partners, North America, as its lead creative agency. Kastner & Partners said it aims to re-energize the 96-year old snack brand, known for products including Wise potato chips and Cheez Doodles, with work aimed at attracting new, younger consumers. The agency said it will handle creative, partnerships and sponsorships, branded experiences, events, video and content production. The myriad phrases on food packaging including best before, best by, expires on, sell by and use by, have baffled consumers for years. Now, two major food industry lobbying groups are working to clear up the confusion by focusing on two phrases. The voluntary plan, announced Wednesday by the Food Marketing Institute and the Grocery Manufacturers Association, suggests using either "BEST If Used By" to describe product quality or the more serious "USE By" for any products for which there are food safety concerns or are highly perishable and therefore should be eaten by a certain date or disposed of. The FMI and GMA, which represent food retailers and food, beverage and consumer packaged goods makers, respectively, urged companies to update their phrasing as soon as possible, with a push for widespread adoption by the summer of 2018. The decision to focus on the two phrases may also help cut down on food waste, an issue the industry is trying to tackle. "Eliminating confusion for consumers by using common product date wording is a win-win because it means more products will be used instead of thrown away in error," said Jack Jeffers, VP-quality at Dean Foods, who led GMA's work on this issue. "It's much better that these products stay in the kitchen – and out of landfills." The plan was supported by a mix of companies, including the country's largest food seller. "Research shows that the multitude of date labels that appear on foods today are a source of confusion for many consumers," said Frank Yiannas, VP-food safety & health at Walmart.